Disposable nursing pads are constructed of the same exact chemicals that are found in disposable diapers. If you have a disposable pad handy, just rip it open and you’ll see tiny crystals, known as super absorbent polymers. These crystals turn into a gel, which causes it to retain liquid. If you visit the disposable pad manufacturer’s website, it most likely states that this gel is hazardous and to call the Poison Control Center if ingested. Doesn’t sound like a healthy place for baby to be feeding, does it? Not to mention that when you’re done with it, it just gets tossed into the trash, and we definitely don’t need to be adding anything unnecessary to our landfills. During the Make it Green in 2015 campaign, we’ve discussed ways to help protect the environment. An easy thing to do when it comes to protection from leaking milk everywhere is to use reusable nursing pads. 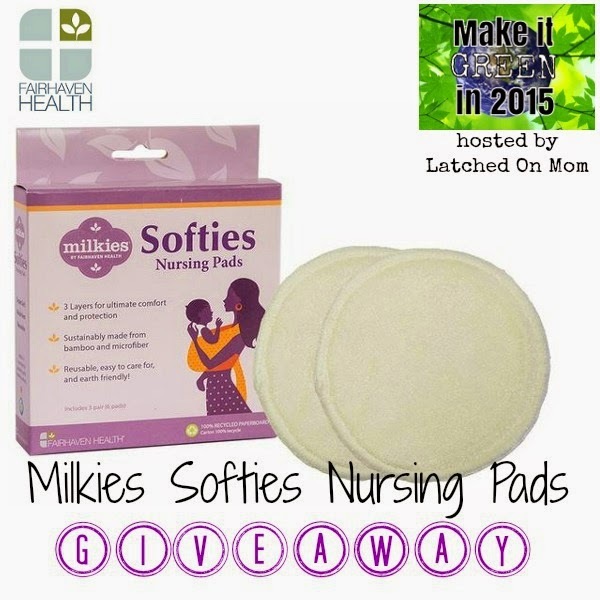 Fairhaven Health has a new product called Milkies Softies Nursing Pads, you can read the full review of this product from Latched On Mom HERE. Fairhaven Health is giving one box away to a lucky mama! Just fill out the competition form below to enter the giveaway! The giveaway will run from 2/2/15-2/16/15. Open to US only. Void where prohibited. Must be 18 years of age or older to enter. Winner will be announced on this post, as well as emailed (so make sure to log into the competition form using the email address you use). You will have 48 hours to respond or a new winner will be drawn. Latched On Mom was given a free product to test for review purposes, but did not receive payment for the review which was given. All opinions are my own, written by me. Other participating bloggers did not receive compensation to promote this giveaway. This giveaway is in no way sponsored, endorsed or associated with Facebook, Twitter, Pinterest or any other social media. Prize fulfillment is the sponsor’s responsibilty..
I’ve never used them since we are still waiting on our first LO, but I plan to use them when we have our first!